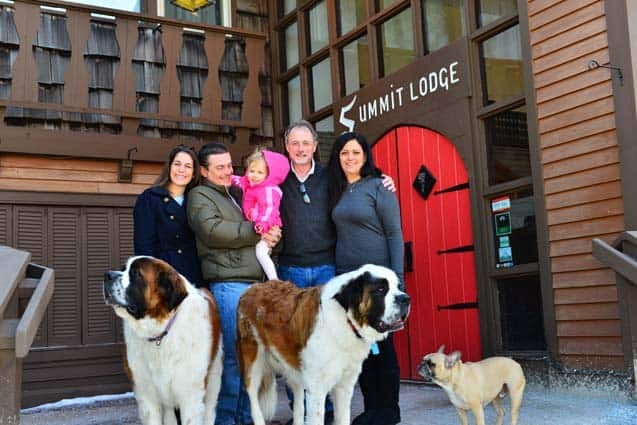 New owners Laura, Emmett and 2-year-old Orlaith O’Dwyer stand with former owner Billy Bauer and Lera Poepoe and their three dogs in front of the Summit Lodge. Emmett O’Dwyer, his wife Laura, and their 2-year-old daughter, Orlaith, have chosen to make Killington, Vt., their home and lead the storied Summit Lodge into its next phase. On Thursday, March 3, Emmett O’Dwyer officially took over from Billy Bauer, who’d spent nearly four decades at the Lodge. The 16,305 sq. ft. lodge has a 180-seat dining room, 45 guest rooms, an outdoor pool, and it sits on 8.36 acres. It went for $1.4 million. O’Dwyer said he plans to keep the originality of the building and many of its key staples, including the dining room chairs, which came from the original owners. In fact, he plans to have more like them manufactured. He does, however, plan to replace the patio furniture by the pool, which he said had served its purpose but was “a bit tired” now. For the summer, he also hopes to add a permanent stone barbecue on the patio, air conditioning in some units, and improve the bridal suite. In purchasing the business he knew it would take a good deal of investment up front and has budgeted accordingly. Most of the initial investments will be largely invisible to guests, he explained. They’ll include a new point-of-sale system, phone and Internet improvements, an improved website with many new photos and an online booking engine. He hopes to do virtually all bookings directly through his website, with Trip Advisor and Facebook directing guests to his site. Since his daughter was born two years ago, the O’Dwyer family has been looking for a business opportunity to support a better lifestyle and a great community for raising a family. They searched nationwide and while they found many business opportunities, those didn’t have the community they desired. “Many were just too seasonal,” O’Dwyer explained. When they came to Killington they met “a bunch of really cool people, many of whom came out during the off-season,” he said, adding that the school system was an important added benefit. His wife, Laura, skis and they hope to get Orlaith on the slopes as early as next season. Emmett O’Dwyer doesn’t ski, but looks forward to learning. In mid-April, the Summit Lodge will shut down for 4-5 weeks for improvements. Many staff members at the lodge have chosen to stick around and help with the improvements. “They are really rolling up sleeves,” he said, pointing to Chef Steve Hatch who he said “was willing to hang up his apron and pick up a shovel.” The lodge will host 13 weddings over the course of the summer, in addition to golf tournaments and other events. O’Dwyer hopes to build up the summer business over time. To prepare for this summer, O’Dwyer said he is staffing up for all positions.